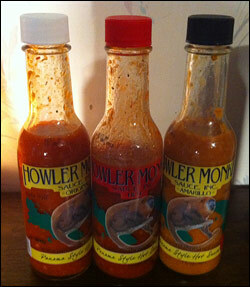 I first encountered the makers of Howler Monkey Panama Style Hot Sauce at this year’s ZestFest in January. Like at any spicy foods show I attend throughout the year, I’ll get sauces solicited to me, often numbering well over ten outside of the “official” vendors over the course of the weekend. During dinner one of the nights, I was handed three bottles of Howler Monkey (which would end up being the subject of this review), and apparently they did not make a great first impression as a week later I could not even recall what they tasted like. Fast forward a few months later, and I had a fresh set of three bottles – Howler Monkey Original, Howler Monkey Hot and Howler Monkey Amarillo Panama Style Hot Sauces delivered to my house. I was eager to get re-acquainted with these to fill in the gaps in my (sometimes) Swiss-cheesed memory and see if a few gems lay somewhere in these bottles. I’m always hopping to sample pepper sauces that are slightly off the beaten path. This often entails trying various styles and genres from around the United States and around the World. I’ve always dug the Panamanian style of hot sauces (called Aji Chombo in that geographic area) with their slightly exotic blend of garlic and turmeric complimenting habanero or scotch bonnet chiles. I then re-tried the this trio this past Spring, and unfortunately I was unimpressed for the most part. Howler Monkey creators Conan Herring and Tom Ellis implored me to expedite the review, and I delayed doing a write-up. There was a protracted time until I did finally come around to testing these three Howler Monkey sauces with additional dishes, and I finally came to final conclusions, which I give below.